Miller + Lotti = Styles Upon Styles. 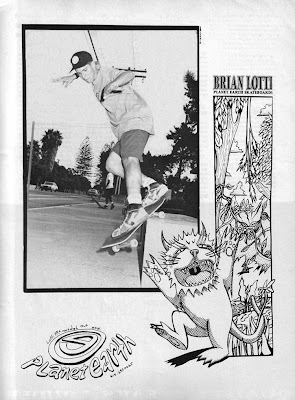 No doubt that just about everybody remembers Chris Miller as one of the most stylish skaters there's ever been, but I think alot of people sleep on what a great artist he is. I think that its largely due to being on G&S at that particular time... I mean Blender's coffee break is my all-time favorite board graphic too but I still have Miller's faces hanging on my wall as well. Now for Lotti... what can I say about this dude. He looked good on a skateboard at a point when you really didn't have to... (what's up with the Darth Vader/Def Leppard "Love Bites" voiceover at the end?). Regardless, legendary status. But the rep got bigger when holmes actually left the Pack of Lies-era Blind team... to become a buddhist. Seriously. He wasn't strung out and he didn't fall off, my man just peaced out and reportedly went to Tibet. That's cool and all... but WHOA! THAT'S NUTS! So it was nice when Lotti started showing up again a few years back. Not that he was throwin hammers down twenty-sets or anything but at least he didn't take the route of some washed-up, has-been pro with obviously nowhere else to go but to peddle generic trucks in the back of Thrasher. He actually threw us a curveball and made a really great movie. The trailer for his new one looks great as well.